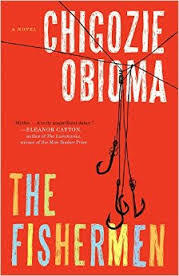 a book chick: "The Fishermen"
my take: The upbeat cover of this book is deceptive ... it is a colorful but oh-so-woe-full tale behind this bright sleeve. It's the story of four brothers - there are six children and the story is mostly about the four oldest - as told by the fourth child. Their father must work away from their village and they are left mostly to themselves as their mother tends her store. Their lives take a terrible turn when they fish in a forbidden river. "What I want you to be is a group of fishermen who will be fishers of good dreams, who will not relent until they have caught the biggest catch. I want you to be juggernauts, menacing and unstoppable fishermen....Not the kind that fish at a filthy swamp like the Omi-Ala, but fishermen of the mind. Go-getters. children who will dip their hands into rivers, seas, oceans of this life and become successful: doctors, pilots, professors, lawyers. Eh?" Which vision will come true? The progression of the tale is heart-breaking, and told with poetic language that made me stop and re-read sentences. Each chapter title is very interesting - usually an animal or reptile - explained by our narrator, Benjamin. The weaving of the present and past is seamless and enchanting. As we looked into the book for discussion, the story tells a bigger metaphorical of Nigeria. My Nigerian history/knowledge is all from novels so I'm gonna trust those in the know on that.